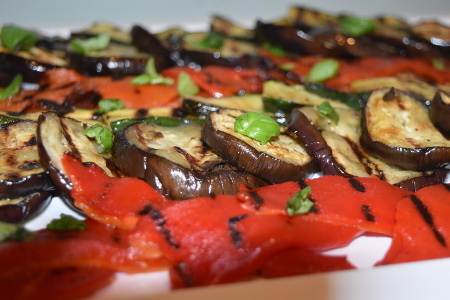 This grilled Mediterranean vegetables recipe is inspired by my love for Mediterranean food. I adore the vibrant, fresh fruit and veg that you find in the Mediterranean and the delicious food that results from them, so I wanted to bring those delicious European flavours to rural Lancashire - maybe then I could forget the rain outside and convince myself that I was enjoying a warm Mediterranean summer evening! I decided to focus on three main vegetables: courgette, aubergine and pepper. 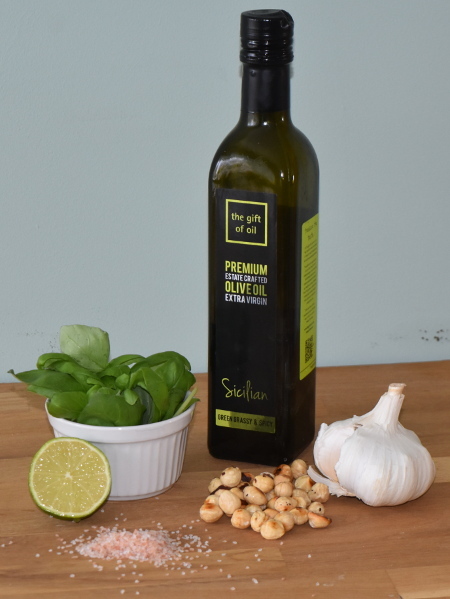 All three of these become soft and juicy when cooked, forming an amazing accompaniment to hummus and flatbreads and working beautifully on pasta. I decided to serve these grilled vegetables with a pesto dressing and flatbreads for my Auntie and her partner – they went down a treat. Check out my Barbecued Flatbreads recipe here. 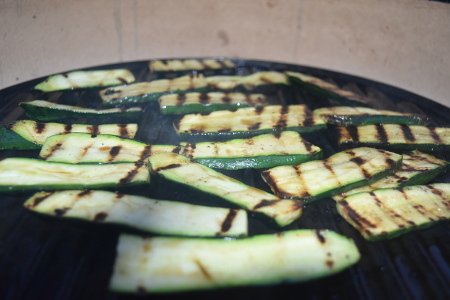 We decided to cook these veggies on a plancha, giving a solid platform for the vegetables to cook (so they don’t fall between the grill grates into the charcoal! 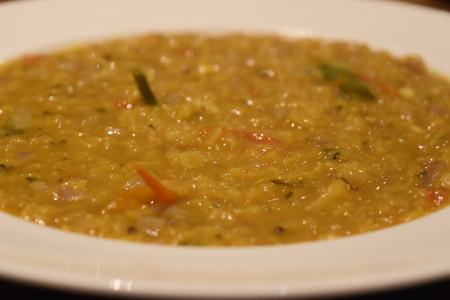 ), while still allowing them to take on that smoky flavour. We put the griddle side up, so we could still create those char lines across the vegetable slices, just to give them that little bit of extra flavour. 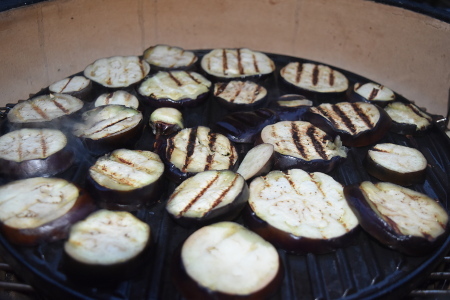 Unlike a lot of other barbecue recipes, this requires a much lower heat – this is because the aubergine needs the time to cook all the way through without burning on the outside; a temperature of 100-150°C (212-302°F) will do just fine. Serves 4. Prep time: 1 hour, cooking time: 20 minutes. Cut the aubergine into 1cm slices, and the courgette into ½cm slices. Place all of the slices into a colander (or into two colanders if one is two small!) and sprinkle a handful or two of salt over the slices, making sure that all slices have an even coverage – this draws out a lot of the bitter juices that you find in courgette and aubergine. Leave them for half an hour, and then rinse the salt off thoroughly. Light the barbecue, and leave until flames are leaping up at the grill. Grill the whole red peppers over flames so that the skin becomes burnt and blistered all over – you shouldn’t be able to see any red bits left on the outside; it should all be black! Once this has happened, take them off the grill and seal them in a plastic bag, allowing them to sweat for about 10 minutes. Once you’ve taken off the peppers, let the flames die down and pop your plancha onto the barbecue, allowing that to heat through ready to cook your veggies. Heat your barbecue to 100-150°C (212-302°F) – only a low temperature is needed for grilled Mediterranean vegetables. Take the red peppers out of the bag and peel off the blackened skin – it should come off quite easily. Cut the peppers in half and seed them ready for plancha grilling. Brush the vegetable slices lightly in olive oil, then pop them on the plancha. For the aubergines, let them cook for 5-10 minutes on each side. For the courgettes and red peppers, cook for 3-5 minutes on each side. 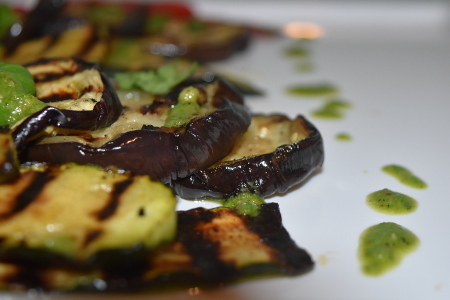 Serve your grilled Mediterranean vegetables with a drizzle of pesto dressing and garnish with a few basil leaves. Put all of the ingredients for the pesto together in a blender, then simply blitz! Taste, then add any extra salt, lemon, basil, nuts or garlic accordingly. I’ve found it almost impossible to come up with a fail-safe pesto recipe because basil leaves always differ in strength, so there isn’t a perfect ratio as far as I’m concerned. Just keep tasting and adjusting until the pesto is perfect! Enjoy!